Stila Cosmetics specialises in cute girly makeup and I do have a touch of fondness for their makeup line. I like the soft texture of their eyeshadows and the rather more muted yet wearable colours available. 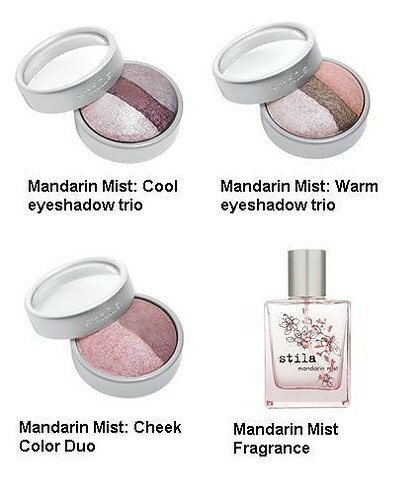 Stila scored a hit with their baked makeup last year – baked eyeshadow trios and blush duos and they look to be repeating their success this year, with the launch of a new fragrance – Mandarin Mist, and a new Mandarin Mist collection to compliment it. Mandarin Mist fragrance – A light, crisp citrus fragrance with notes of mimosa and yuzu fruit. Sounds positively delish! Mandarin Mist eyeshadow trio: Cool – High shimmer eyeshadow. Light pink, cool taupe and rich brown. Mandarin Mist eyeshadow trio: Warm – High shimmer eyeshadow. Peach, Warm rose and golden brown. I would be keen on this one. Mandarin Mist cheek colour duo – Soft peach and rosy bronze blush duo to highlight and contour cheeks. I called up the Stila counter in 1 Utama and was told that it is not here in Malaysia yet but will be expected maybe in August 2007. This is Stila’s limited edition summer collection so expect it to sell out quickly. Last year’s did. The eyeshadow trios and blush previously retailed for RM120 each, so expect similar or same prices this time. I see that the cheek color duo has a brown/maroonish tone to it, will it appear odd when you swipe it across your cheeks? I’ve never tried blush duos before. PB says: Usually the darker shade is for contouring i.e to create an impression of sculpted cheeks. But you can also swirl both colours together to create a different colour. Best thing is just to test it out at the counter. I prefer the colour of last year’s summer/fall – a sweet pink. That was nice. I’ve always wondered (but never asked) what’s the difference between baked makeup and normal makeup?